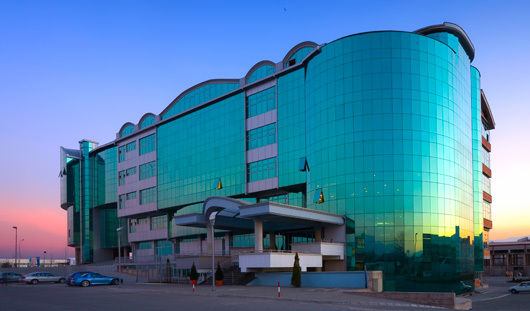 The lectures at FON University are held at the new University campus situated on an area of 30,000 sq. meters and located in the municipality Aerodrom. The campus meets the highest modern working and teaching, as well as ECTS requirements. The University campus disposes of high capacity amphitheatres with 300 or 200 seats, as well as many lecture halls and classrooms, where in compliance with ECTS, lectures could be held in small groups of 25 or 35 students. The teaching process at all the faculties applies the principles of the Bologna Declaration and the ECTS model. This type of studies, first and foremost, provides the student with the opportunity to have mobility, to follow classes in smaller groups, practical courses, learning several foreign languages etc. The structure of the studies, depending on the faculty, is 3+2 years of study or 4+1 years of study. The first two or three years, within almost all of the faculties, are structured as general studies, and in the forth year the student focuses on a smaller field of expertise. The classes are interactive and the teaching conditions are set to correspond to the specific needs of each faculty. The entire building is covered with wireless Internet network.